Three sessions with the artist during regularly scheduled art classes. (See schedule). Each student will create a unique print for inclusion in the collaborative work of art. Artist introduces the concept of symbols in art making, Adinkra symbols of West Africa, along with relevant art examples. 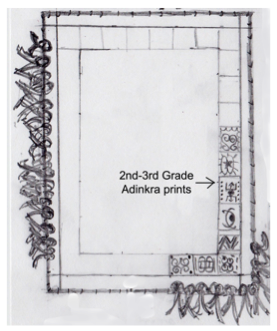 Artist presents Adinkra symbol packets and sketch/transfer processes. Students research symbols and associated meanings; make choices & sketches. Students transfer the sketch to styrofoam using graphite transfer process; complete with relieflines and fill-in; glue to print plate card. 1. Artist presents works by printmakers Elizabeth Catlett and Margaret Burroughs. 3. Artist reviews deep relief process and demonstrates addition of geometric border. 4. Students complete print plates then move to print stations to make individual prints of their symbols of peace.Waiting student print their own print pieces + writing extension. 1. The artist demonstrates the addition of sewn fiber and beadwork to the printed border. 2. Students work collaboratively on the piece of art to stitch & add adornment. 3. Students complete individual print pieces. Students may benefit from exploring the guiding concepts listed each week of the residency schedule, and through other classroom activities related to bullying and peacemaking. See the book list on our google doc and library books selection. You might also want to check out the PBS streaming videos from our google doc.